File photo of Pallavi Sharma. The Gauhati High Court on Monday has ordered Pallavi Sharma, the daughter of Tezpur Lok Sabha MP RP Sharma, and an accused in the multi-crore APSC scam, to surrender before the Court of Special Judge in Guwahati on or before August 24, 2018. It may be mentioned that Pallavi Sharma, the who served as a Deputy Superintendent of Police (DSP), was arrested on July 18 this year and had been lodged in the Guwahati Central Jail, before being granted 14-day interim bail on August 1 by the Gauhati High Court as on the ground that her father, BJP leader and Tezpur MP RP Sharma’s health was not in good condition and was taking treatment in Kolkata. The Gauhati High Court while granting interim bail to Pallavi Sharma earlier was instructed not to get herself engaged in works other than attending her father in Kolkata. 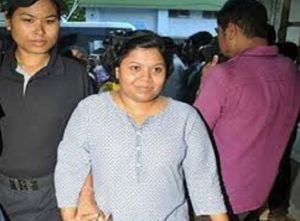 According to media reports, following a medical report that the MP’s health had improved, the Gauhati High Court on Monday directed Pallavi Sharma to surrender on or before August 24, 2018.